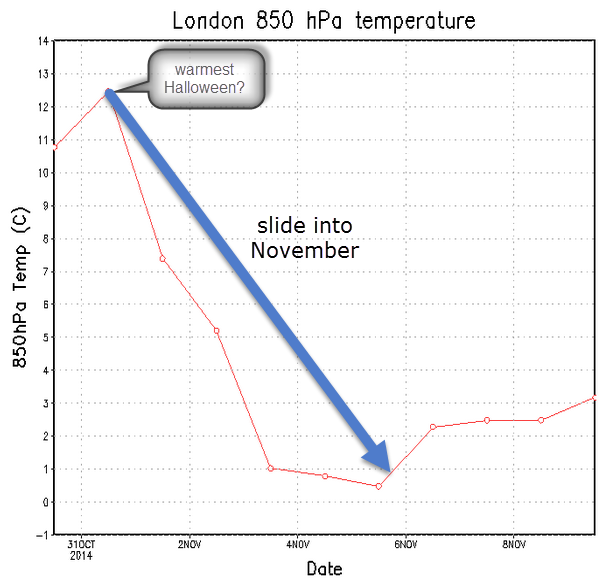 #Reigate Halloween heatwave: trick or treat? The end of October has continued to be warmer than average for the season and Friday 31 October could be the warmest Halloween on record (current record around 19C). Hi Res models show the highest temps most likely somewhere inland away from cooler seas and an incoming cold front from the west. If the sun comes out, which is most likely in the SE or East Anglia and under such a dry southerly air flow, temperatures could rise to over 20C, or even 23C in places. Whilst this unseasonably freaky warmth cannot really be described as a heatwave (there are technical requirements to classify as a heatwave) the headlines might be correct in suggesting a possible record breaking temperature maximum on Friday. Thereafter, November temps take a tumble nearer seasonal average through next week and at times even below average. So whilst we can enjoy the treat of near summer like temps tomorrow by next week it will be some 10C cooler as Autumnal temperatures and more rain take a hold, though nothing extraordinary. Compare this with the first winter storm warning of the year on the East Coast USA where temps are set to freeze and the first substantial snow in the mountains is likely to occur this weekend. Real cold for E USA not UK! Along with temperature, pressure is set to fall through the weekend and into early next week as a depression hovers NW of the UK over Iceland and brings Reigate some breezy SW winds on fronts with rain reaching us in the SE on occasions over the weekend and into the early part of next week. A cold front later on Sunday looks especially likely to be the one to usher in the distinctly cooler polar air overnight into Monday as a trough pushes out the high pressure which moves east taking any remaining mild air into the continent. During the first part of next week the LOW moves SE over the UK and brings unsettled cooler and damper conditions to Reigate. This LOW is due to then move further to the south / SE over the continent and deepen to become a feature called a “cut-off” low. 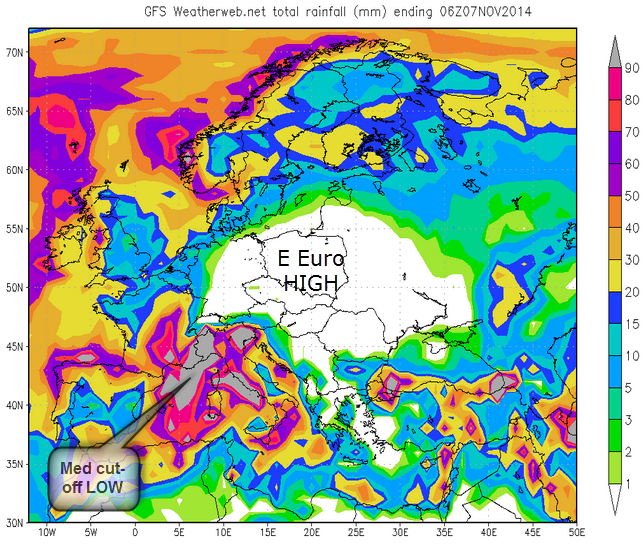 This is modelled to move over the continent to the Alps and N Italy where especially heavy rain is possible and then to parts of the Mediterranean which could cause unsettled conditions to arrive in the NW Med later in the week. There is some uncertainty as to how the end of next week and next weekend plays out for the UK and us in the SE once this cut-off feature moves off. It seems likely that another depression with fronts could sweep across the N of the UK and bring more unsettled conditions towards the end of next week with fronts and rain for the NW. But there are also signs of higher pressure building from the south again. Either way, temperatures are going to be more averagely Autumnal and November-like, unlike the warm temperature tricks October has played. A quick reminder that, unless November and December are markedly cooler (and the jury is out on this) then 2014 is STILL on target to become one of the warmest years on record for the UK and certainly one of the warmest. Every month has been well above average temperature (see below, CET means Central England Temperature) except of course August which was the coldest for 21 years! 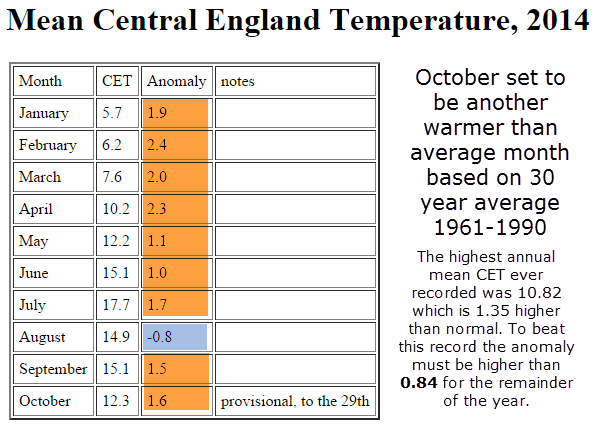 Despite this hiccup October looks to be warmer by over 1.5C and ending on a corker. Nevertheless, perhaps celebration of such temperatures should be tempered by remembering that this kind of anomalous heat is exactly the kind climate change expected by IPCC predictions and, although anomalous warmth is pleasant for humans, it is just as stressful to wildlife and the environment as severe conditions such as storms and cold snaps. Finally, it’s worth noting recent press headlines regarding a possible COLD winter. Such scare-mongering headlines in the Express and Star and similar papers are usually based on just one or two seasonal forecasts from a few meteorologists who might be described as on the fringes of mainstream weather forecasting. Whilst RGSweather does not write seasonal forecasts, it is worth sharing that some of the wider expert and reputable weather community, including both professionals and amateur, is pretty animated about the possibility of a colder than average 2014-2015 winter (that is of course Dec, Jan and Feb). This is despite several of the standard weather models indicating a rather warm winter at this stage (including our own UK Met Office). There is a lot of discussion about it. Making a winter forecast is a complicated process because it is based on many interacting factors in the atmosphere, the cryosphere and the oceans which are combined together by expert forecasters to assess likely winter conditions. Winter forecast indicators include factors such as the extent and build up of early Autumn snow cover over Siberia/Russia (encouraging HIGH pressure and cold easterlies), Arctic Ice cover (low ice cover warms Poles, increasing pressure, pushing cold air out to mid latitudes), the North Atlantic Oscillation and Arctic Oscillation (based on development of Azores High and Icelandic LOW) and associated amplification of the jetstream, how strong it is and how wiggly (meridional) or straight (zonal) it is, (a weak jetstream with -ve NAO allows polar air to leak out into mid latitudes), the strength of the polar vortex in the stratosphere as indicated by the an equatorial lower stratospheric wind pattern called the Quasi-biennial oscillation (QBO). A westerly phased QBO is correlated with possible increase in likelihood of Sudden Stratospheric Warming episodes that have been linked to downwellling of cold air into mid latitudes some weeks after a SSW). Phew, you can see there are loads of tricky indicators to watch. This year, the October Pattern Index (OPI) is gaining attention as a possibly reliable predictor of winter outcomes. Basically, the OPI is a clever measure of upper atmospheric conditions in October and particularly how amplified (or wiggly) the jetstream is looking. Scientists have found that atmospheric conditions in October correlate well with winter outcomes. A negative OPI, for example, correlates amazingly well with a negative NAO (north atlantic oscillation) occurring later in the winter. A negative NAO indicates a weak jetstream, itself possibly caused by low Arctic Sea Ice and high Siberian snow cover. A negative NAO can, given the right synoptic pressure patterns (placing of HIGH and LOW pressure), be conducive to incursions of COLD air from the Poles reaching mid latitudes like the UK. All this is experimental but extremely interesting and rather important given the rapid climate change going on in the Arctic.